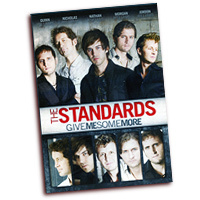 We've been big fans of the Standards, five sweet-singing brothers from Idaho, twice when they nearly won the Harmony Sweepstakes Finals, and then there were their four excellent CDs. "Collection" is a sometimes accompanied, 16-song best-of album that may be better described as a "tour de force" album. Our favorites are of course the a cappella cuts, "I Got A Feelin'," "Put a Little Love in Your Heart," a kickin' vocal percussion arrangement of Van Morrison's "Brown Eyed Girl," a dreamy, soaring "In Absence," wonderful vocal "horns" on the Mamas and the Papas' hit "California Dreamin'," the rhythmic, powerful "I Can't Break Away," and live covers of Bill Withers' "Lean On Me," "Put a Little Love in Your Heart," the Motown hit "Just My Imagination," "Brown Eyed Girl," Smoky Robinson's hit "My Girl," the Doo-Wop anthem "The Lion Sleeps Tonight" and the jazzy, surprising "Single Grain of Sand." These last seven tunes remind us of why we loved The Standards, one of the best live shows in the business, wonderful harmonies, strong vocal percussion, leads to die for. "Collection" is big fun, don't miss it! It's great for us to cue up "Give Me Some More," and once again be blown away by the live show of Quinn, Nicholas, Nathan, Morgan and Jordan, the brothers from Idaho who twice nearly won the Harmony Sweepstakes Finals. Not only can we sit in with the lucky, up-close Nashville audience, but we get to sit down with the guys after a song and hear them talk about their creative process, how they came to choose, arrange or write a song, and see how passionate they feel about their music. 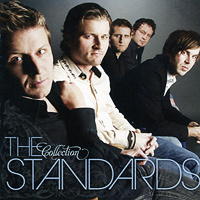 The Standards' live show has only grown more entertaining and polished from their years of touring and live concerts. There are nine cuts here, all a cappella, and all of them energetically choreographed. Our favorites are the intro title tune "Give Me Some More," "Put a Little Love in Your Heart," a rockin', sing-along arrangement of Van Morrison's "Brown Eyed Girl," a sweet cover of Bill Withers' "Lean On Me," a very fun, audience-participation cover of the Motown hit "Just My Imagination," Smoky Robinson's anthem "My Girl," the high-energy country rocker "I Got a Feelin'," a totally jungle arrangement of the Doo-Wop anthem "The Lion Sleeps Tonight," the jazzy, surprising "Single Grain of Sand" and closing with a surprising group-written and choreographed original, "Dance of the Mamba" with black lights and day-glow costumes that will knock your socks off! Wait a minute, we picked every song-this reminds us of why we love The Standards, one of the most fun live shows in the business, wonderful harmonies, strong vocal percussion, top-drawer leads, cool choreography. "Give Us Some More!"